The death toll from Friday's protests on the Gaza border rose to nine early Saturday as two Palestinians including a journalist shot by Israeli troops died. The Palestinian Journalists' Syndicate identified the person fatally shot through photos and video as Yasser Murtaja, 31. He was wearing a vest labeled "PRESS," on the front. All six journalists were shot despite clearly identifying themselves as media, the PJS said. Murtaja worked for the Gaza-based news agency Ain Media, according to the PJS. "He was kind, gentle, and caring, eager to become the best journalist he could be, because his aim was always to document the Palestinian people's suffering," Rori Don­aghy, a Middle East consultant and former Middle East Eye news editor, who spent time with Murtaja in Gaza, told the Washington Post. "It's really sad." Murtaja was shot in the lower abdomen as he covered the demonstrations in Gaza city. [post_ads]Israeli Defense Forces said: "The IDF does not intend to shoot at journalists, and the circumstances in which journalists were allegedly injured by IDF gunfire are unknown and are being investigated." A total of 491 Palestinian suffered gunshot wounds demonstrating on the Gaza border on Friday despite burning stacks of tires in an attempt to shield themselves from Israeli troops gunshots. Another Palestinian, Hamza Abdul All, 20, also died from injuries sustained in the Gaza protests overnight, which brings the death toll from Friday's demonstration at the border fence to nine. Over the past week, 31 people have been died in the clashes between Israeli forces and Palestinian demonstrators along the Gaza border with Israeli forces firing into the crowd of protesters. 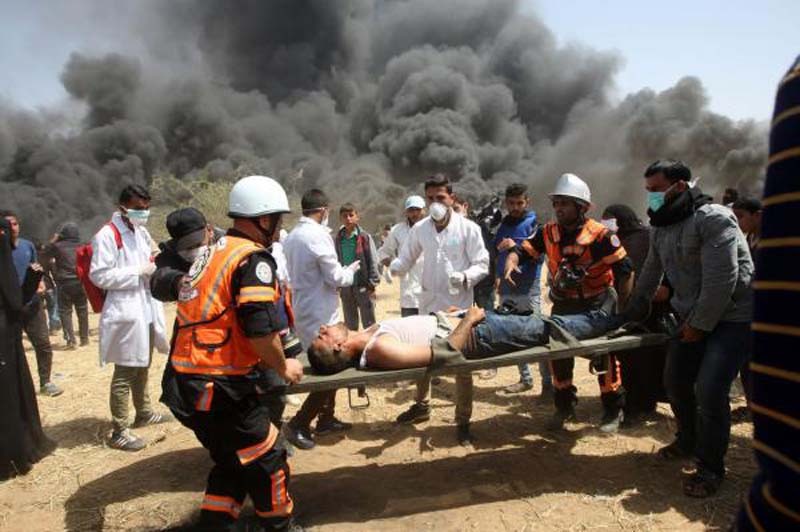 According to the Palestinian health ministry in Gaza, 1,296 Palestinians have also been wounded. Though the majority of demonstrators have been peaceful, Israeli forces say they are forced to use live ammunition because Hamas, identified as a terrorist organization by Israel and the United States, is using the demonstrations as a cover to plant explosives. Most people have been shot in the legs in an apparent military strategy to aim at the lower limbs. The violence has broken out amidst a planned six weeks of mass demonstrations along the Israel-Gaza border, which is called the "March of Return," to signify the Palestinians demand of the right to return to the homeland. Demonstrations started on March 30, Palestinian Land Day, which is the same day Israeli troops killed six Arab Israelis during the 1976 protest against confiscation of Arab land.